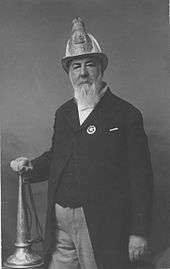 Alexander "Alick" Joy Cartwright Jr. (April 17, 1820 – July 12, 1892) is referred to as a "father of baseball". 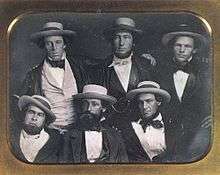 The rules of the modern game were thought to be based on the Knickerbocker Rules developed by Cartwright and a committee from his club, the Knickerbocker Base Ball Club, in 1845, although this is disputed. With the myth of Abner Doubleday inventing baseball debunked, Cartwright was inducted into the National Baseball Hall of Fame as a pioneering contributor 46 years after his death. Although it has been stated in secondary sources that Cartwright was officially declared the inventor of the modern game of baseball by the 83rd United States Congress on June 3, 1953, the Congressional Record, the House Journal, and the Senate Journal from June 3, 1953 did not mention Cartwright. Cartwright was born in 1820 to Alexander Cartwright, Sr. (1784-1855), a merchant sea captain, and Esther Rebecca Burlock Cartwright (1792-1871). Alexander Jr. had six siblings. He first worked at the age of 16 in 1836 as a clerk for a Wall Street broker, later doing clerical work at the Union Bank of New York. After hours, he played bat-and-ball games in the streets of Manhattan with volunteer firefighters. Cartwright himself was a volunteer, first with Oceana Hose Company No. 36, and then Knickerbocker Engine Company No. 12. Cartwright's ancestor Edward Cartwright immigrated from Devonshire, England to New England around 1661. Cartwright married Eliza Van Wie, from Albany, on June 2, 1842. A fire destroyed the Union Bank in 1845, forcing Cartwright to find other work. He became a bookseller with his brother, Alfred. Cartwright led the establishment of the Knickerbocker Base Ball Club (after the Knickerbocker Fire Engine Company) in 1842. The Knickerbockers played a brand of bat-and-ball game often called "town ball" or "round ball," but in New York more usually "base ball," somewhat similar to but not identical to the English sport of rounders, on a field at 4th Avenue and 27th Streets. The first clearly documented match between two baseball clubs under these rules took place on June 19, 1846, at Elysian Fields in Hoboken, New Jersey. In this match, the Knickerbockers lost to the "New York Nine" by a score of 23 to 1. Some authors have also questioned the supposed "first game" under the new rules. The Knickerbockers' scorebook shows intra-club games during 1845; the New York Base Ball Club played at least three games against a Brooklyn club in 1845 also, but the rules used are unknown. Those who have studied the score-book have concluded that the differences in the games of 1845 and 1846, compared with the specifications of the Knickerbocker rules, are minimal. In 1849, Cartwright headed to California for the gold rush, and then continued on to work and live in the Kingdom of Hawaii. His family came to join him in 1851: wife Eliza Van Wie, son DeWitt (1843–1870), daughter Mary (1845–1869), and daughter Catherine (Kate) Lee (1849–1851). In Hawaii, sons Bruce Cartwright (1853–1919) and Alexander Joy Cartwright III (1855–1921) were born. Some secondary sources claim Cartwright set up a baseball field on the island of Oahu at Makiki Field in 1852, but Nucciarone states that before 1866, the modern game of baseball was not known or even played in Honolulu. Also, she states that during Cartwright's lifetime he was not declared or documented as an originator of baseball in Hawaii. Cartwright served as fire chief of Honolulu from 1850 through June 30, 1863. He was an advisor to King David Kalākaua and Queen Emma. Cartwright died on July 12, 1892, six months before the overthrow of the Hawaiian monarchy in 1893. One of the leaders of the overthrow movement was Lorrin A. Thurston who played baseball with classmate Alexander Cartwright III at Punahou School. He was buried in Oahu Cemetery. After about two decades of controversy, invention of America's "national game" of baseball was attributed to Abner Doubleday by the Mills Commission (1905–1907). Some baseball historians promptly cried foul and others joined throughout the 20th century. Cartwright was inducted into the Baseball Hall of Fame in 1938. New York City librarian Robert W. Henderson documented Cartwright's contributions to baseball in his 1947 book Bat, Ball, and Bishop. Although there is no question that Cartwright was a prominent figure in the early development of baseball, some students of baseball history have suggested that Henderson and others embellished Cartwright's role. The primary complaint is that touting Cartwright as the "true" inventor of the modern game was an effort to find an alternative single individual to counter the "invention" of baseball by Abner Doubleday. Cartwright was the subject of a 1973 biography, The Man Who Invented Baseball, by Harold Peterson. He was the subject of two biographies written in 2009. Jay Martin's Live All You Can: Alexander Joy Cartwright & the Invention of Modern Baseball supports Cartwright as the inventor of baseball, while Alexander Cartwright: The Life Behind the Baseball Legend by Monica Nucciarone credits Cartwright as one of the game's pioneers but not its sole founder. The 2004 discovery of a newspaper interview with fellow Knickerbocker founder William R. Wheaton cast doubt on Cartwright's role. Wheaton stated that most of the rules long attributed to Cartwright and the Knickerbockers had in fact been developed by the older Gotham Club before the Knickerbockers' founding. In 1938, Makiki Field in Honolulu was renamed Cartwright Field. The Cartwright Cup is awarded to the Hawaii state high school baseball champions each year. In 2016, experts verified the authenticity of a set of documents titled "Laws of Base Ball" written in 1857 by New York Knickerbockers president Daniel "Doc" Adams after a discussion with executives of 14 other New York-area clubs. The documents established the rules of the game, including nine innings, nine players on the field and 90-foot basepaths. Cartwright was not a participant at the 1857 meeting, as he was living in Hawaii. ↑ Hershberger, Richard. "The Creation of the Alexander Cartwright Myth". The Society for American Baseball Research. Retrieved 9 May 2016. 1 2 Ty Cobb: Safe at Home. Globe Pequot. 2008. ISBN 9780762744800. ↑ "Alexander Cartwright". Official website of Alexander Cartwright. ↑ Alice Low and John O'Brien (2009). The Fastest Game on Two Feet: And Other Poems About How Sports Began. Holiday House. ISBN 9780823419050. ↑ "Year In Review : 1953 National League". Baseball Almanac. ↑ Jim Lilliefors (2009-07-01). Ball Cap Nation: A Journey Through the World of America's National Hat. Clerisy Press. ISBN 9781578604111. ↑ Berenbak, Adam (Fall 2014). "Henderson, Cartwright, and the 1953 U.S. Congress". Baseball Research Journal. Society for American Baseball Research. Retrieved 14 May 2016. 1 2 3 Monica Nucciarone. "Alexander Cartwright". Society for American Baseball Research. Retrieved 8 January 2014. ↑ The identification of Cartwright in this image is at least controversial. Articles seriously challenging this identification can be found in Society of American Baseball Research (SABR) newsletters at "Just Another Misidentified Baseball Photo?". Society of American Baseball Research. October 2011. Retrieved August 16, 2012. and at " So, are there any Knickerbockers in that 1840’s half-plate daguerreotype?". Society of American Baseball Research. March 2012. Retrieved August 16, 2012. ↑ "Alexander Cartwright: First Modern Game of Baseball 1845". Baseball Historian. Archived from the original on 12 July 2000. ↑ Baseball: A History of America's Favorite Game. Random House Digital, Inc. 2008-12-24. p. 21. ISBN 9780307494061. ↑ Kittel, Jeffrey. "Evolution or Revolution? A Rule-By-Rule Analysis of the 1845 Knickerbocker Rules". Retrieved 9 May 2016. 1 2 Nucciarone, Monica (2009). "Chapter 2: The Knickerbocker Base Ball Club of New York". Alexander Cartwright: The Life Behind the Baseball Legend. Lincoln, Nebraska: University of Nebraska Press. pp. 12–22. ISBN 978-0-8032-3353-9. 1 2 Nucciarone, Monica (2009). Alexander Cartwright: The Life Behind the Baseball Legend. Lincoln, Nebraska: University of Nebraska Press. p. 207. ISBN 978-0-8032-3353-9. Retrieved 7 August 2016. ↑ "Cartwright, A.J. office record". state archives digital collections. state of Hawaii. Retrieved 2010-01-06. ↑ Robert William Henderson (1947). Ball, bat and bishop: the origin of ball games. Rockport Press. ↑ Thorn, John (March 12, 2011). "Debate Over Baseball's Origins Spills Into Another Century". The New York Times. Retrieved August 28, 2013. ↑ Bailey, James. "Dueling Cartwright biographies offer differing views of his contributions". Baseball America. Retrieved August 28, 2013. ↑ Nucciarone, Monica (2009). Alexander Cartwright: The Life Behind the Baseball Legend. Lincoln, Nebraska: University of Nebraska Press. p. 229. ISBN 978-0-8032-3353-9. Retrieved 7 August 2016. ↑ Nucciarone, Monica (2009). Alexander Cartwright: The Life Behind the Baseball Legend. Lincoln, Nebraska: University of Nebraska Press. p. 218. ISBN 978-0-8032-3353-9. Retrieved 7 August 2016. ↑ "Cartwright Cup for state baseball champ unveiled today". The Honolulu Advertiser. May 6, 2007. Retrieved August 28, 2013. ↑ "'Laws of Base Ball' documents dated 1857 establish new founder of sport". ESPN. 8 April 2016. Retrieved 9 May 2016. Wikimedia Commons has media related to Alexander Cartwright. "Alexander J. Cartwright Jr. Bio". Mr Baseball.com. "Alexander Cartwright". Find a Grave. Retrieved September 3, 2010. "Four Fathers of Baseball" by John Thorn. Thorn Pricks July 16, 2005.